The USPS has a set of rules and regulations governing certain things you must do or follow, pertaining to the usage or installation of an urban or rural mailbox. However, as long as you follow the basic rules of installing your mailbox between 6” and 8” from the curb, between 41” to 45” high and get a USPS approved mail receptacle, you can decorate it almost however you’d like. Of course, there are some exceptions. So, before you choose to do any type of custom mailbox options, you may want to check with your local postmaster to be sure what you’re planning will fit within their regulations and restrictions. One way you can customize your mailbox is with custom mailbox lettering. Many people choose to put their last name on their mailbox, with pre-printed sticker letters they can easily find at most home improvement stores. However, the selection of lettering is quite limited at these locations. Most often, you can get silver or gold tone letters to peel off and use to create your last name on your box. Today there are companies all over the world offering more customized lettering for your mailbox. You can choose from hundreds of lettering fonts and colors online and have the stickers shipped to you so you can apply them to your mailbox. 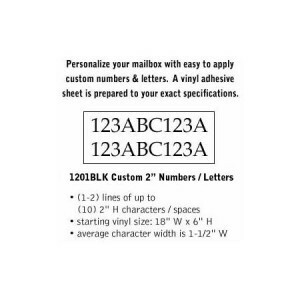 Much like the custom mailbox lettering, you can also get decorative mailbox address numbers in sticker form. Instead of the boring white, silver or gold numbers found in most mailbox areas of the home improvement store closest to you, you can get artistic fonts and colors of your house number. This can help you add charm and personality to your mailbox, without exerting too much effort or investment. If you want to add even more pizzazz to your mailbox, you can always choose to personalize or customize it with custom decals and mailbox covers. Decals are a less expensive way to add your own personal touches to a mailbox. Many people choose to use decals to showcase their favorite sporting team, hobby or job (such as firefighting or other notable profession). The decals can easily be placed on the side of the mailbox, without having to detach the mailbox in any way. If you’d like to have more decoration or would like to change your mailbox decorations often, it’s best to opt for decorative mailbox covers. These handy covers can be slipped off and on, easily. Often, homeowners will change them for the seasons or for specific holidays. For instance, some homeowners will have a different mailbox cover for Valentine’s Day, St. Patrick’s Day, Easter, 4th of July, Halloween, Thanksgiving and Christmas. This allows them to decorate their mailbox much like they might decorate the exterior of their home for each holiday. When you customize your mailbox to match the charm of your personality or home, you’ll get satisfaction knowing it reflects what you love. You can easily customize any mailbox by using custom mailbox lettering, custom mailbox numbers, custom mailbox decals or custom mailbox covers.